While the media freedom principles are a mix of idealism and practicality, the action plan is much more explicit since the work laid out must be done over a few months as Libya prepares for free elections. First and foremost, the delegates pledged to promote the principles and action plan at forums and debates across the country. The document must “be made a living thing”, one person said. The NTC has regional councils and it is those venues where the discussion will ensue. Creating “a vehicle to ensure that the principles are embodied in the constitution” was the expressed desire of the conferees, as they pledged to support candidates who would enshrine media freedom in the constitution. There was great interest in establishing a consultative council of experts to help work through many of the complexities of a media system mentioned at the conference. Several suggestions for funding such a venture were discussed. The need to inventory state media is something that the NTC and its committees can do likely with outside help to evaluate properties and determine which are likely to be viable enterprises. Temporary licensing authority for existing broadcasters prevents the chaos mentioned above. This would be a short-term solution that would need to be followed by a longer term fix and set of policies and practices. Getting journalists trained to cover the elections seems within reach if some of the more than 11 NGOs involved in on-site training ventures can help. The creation of a code of ethics is a longer term matter but would be a step toward alleviating the worries of some conferees that the country badly needs a professional media, dedicated to quality journalism. Promote and discuss these principles through a series of public forums and debates. Create a vehicle to ensure the principles are embodied in the constitution and future legislation. Establish and convene a consultative council of experts to advise on the advancing these principles. Inventory and assess existing state media and communications infrastructure. Grant temporary operating authority to existing broadcasters and electronic media, until an independent regulator is established. Train journalists and people in civil society to professionally cover elections. 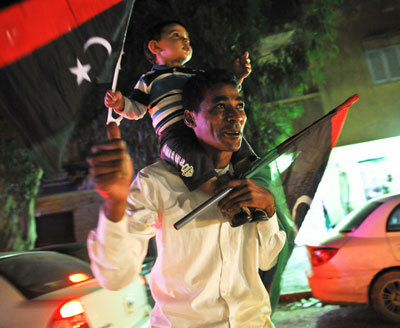 Journalism organizations should create a code of ethics for Libyan media.